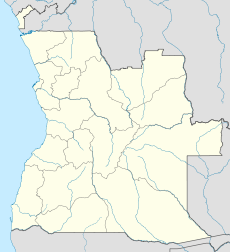 Benguela Airport (Portuguese: Aeroporto de Benguela) (IATA: BUG, ICAO: FNBG) is an airport serving Benguela, the capital city of the Benguela Province in Angola. It is also known as Gen. V. Deslandes Airport. The airport resides at an elevation of 118 feet (36 m) above mean sea level. It has one runway designated 14/32 with an asphalt surface measuring 1,620 by 30 metres (5,315 × 98 ft).